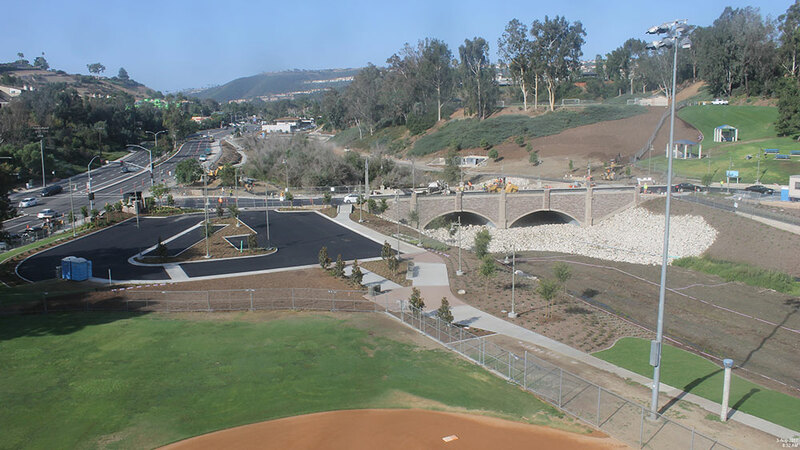 The project is located in the City of Laguna Niguel, in Crown Valley Park. The Crown Valley Park Channel Entry Improvements Project improved access to the Park with a new bridge to replace an Arizona crossing, improved water quality by constructing a wetland and bio-swales, provided two additional parking lots and converted 20 acres from potable water to reclaimed water. The Park was accessible using an Arizona crossing that would be closed during small to medium rain events, as the contributing creek discharges the runoff from a 1,200 acres watershed. The new bridge eliminates the crossing issue with a beautifully designed bridge with arches. The bridge itself in additional to its functionality has beautifully laid cladding and veneer and is a , with a large entry arch. The bridge itself is a great architectural engineering structure with beautiful creme cladding, that welcomes the park visitors with a lit archway that spans the width of the bridge. The bridge provides bike lanes and sidewalks on both sides. The project received funding from the Integrated Regional Watershed Management grant, OCTA and MNWD. The project also provides stormwater quality improvements with the installation of a trash boom at the outlet of the regional drainage into the park, followed by bioswales, then a wetland with a forebay, then another series of bioswales before connecting with the main creek. The project also reduces potable water use for the park and a 20 acres botanical garden through a new reclaimed water system. The Crown Valley Park is one of the City’s busiest parks with an average visitors exceeding 300,000 per year. The park includes soccer and softball fields, a swimming pool that supports swim and dive teams and local and regional dive meets, an award winning sprayground park, an amphitheater, a 20 acres botanical garden and a YMCA facility. With all of these features that the community benefits from, and expect to be able to use year round, the Arizona crossing that results in park closure during rainy days needed to be replaced with a bridge, and the project solved this problem. The project also provides many environmental features such as a wetland, bioswales, native plants, reduction of water use and replacement of potable water with reclaimed water. In addition, the project has major stormwater quality improvements with two large Stormtrap vaults for hydromofication, a trash boom and a wetland. The project triggered various resource agencies permits as the construction took place in the creek. The City worked with the resource agencies to obtain permits and developed a habitat mitigation plan and a monitoring plan. In addition, the City worked with Moulton Niguel Water District to retrofit 20 acres from potable water to reclaimed water, including the installation of 2 pumps to support the irrigation of the Laguna Niguel Botanical Gardens. The City partnered with MNWD to construct all new water system and received a reimbursement of $300,000. The City applied for OCTA Tier 2 ECP Grant for $1,621,962 and Prop 84 Grant from the State Water Resources Control Board for $700,000. The grants received were competitive grants and the City received high ranking due to the multitude of benefits included in the project. Benefits included new trails, new bridge overcoming flooding obstacles, wetland and bioswales and trash booms to improve water quality, drought tolerant landscaping replacing 2.3 acres of turf, reducing water consumption up to 32 ADY and water demand by 7 AFY. The Crown Valley Park Channel Entry Improvements Project improved access to the Park with a new bridge to replace an Arizona crossing, improved water quality by constructing a wetland and bio-swales, provided two additional parking lots and converted 20 acres from potable water to reclaimed water. The Park was accessible using an Arizona crossing that would be closed during small to medium rain events, as the contributing creek discharges the runoff from a 1,200 acres watershed. The new bridge eliminates the crossing issue with a beautifully designed bridge with arches. The bridge itself in additional to its functionality has beautifully laid cladding and veneer and is a , with a large entry arch. The bridge itself is a great architectural engineering structure with beautiful creme cladding, that welcomes the park visitors with a lit archway that spans the width of the bridge. The bridge provides bike lanes and sidewalks on both sides.